Hope all my stenciling friends are having a T-riffic Tuesday! Now last week you might remember that we shone our stencil spotlight on the oh-so fabulous Diamond Damask Stencil. Today we’re going to take a slightly different twist and shine our spotlight on decorative artist, Kass Wilson. She has designed oh-so-many fabulous spaces and many use our stencils to add the ultimate WOW factor. So let’s take a look at what makes our friend Kass Wilson super special! Kass Wilson is a decorative artist with a passion for creating stunning spaces that incorporate “surprises” (like a stencil :)). She’s been in the design industry for over 20 years and has had a lifelong fascination with depth of color, dimension and the unexpected. I think we can now see why stencils and Kass go hand in hand! 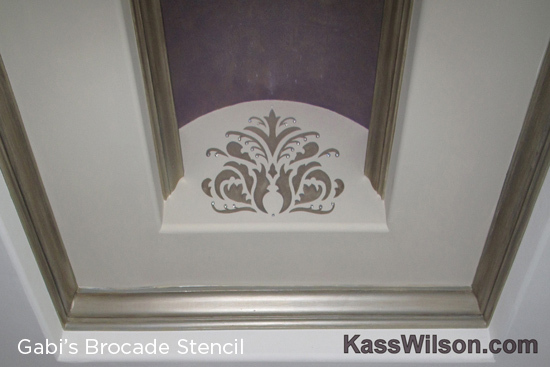 Kass says, ” Success for me is when my faux finish surfaces and decorative artistry are so intriguing that you just have to touch it!” Now let’s look at some of her GAW-GEOUS stenciled spaces! 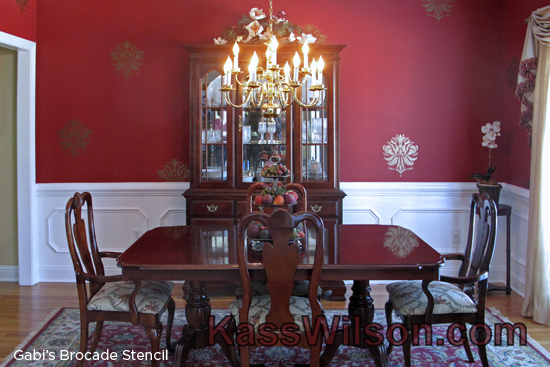 Our first stop on this decorative painting tour is a deliciously stenciled dining space. It’s bold, dramatic and commands your attention making a beautiful statement. The shimmering gold Gabi Brocade Stencil adds the perfect touch of class. Love color and pattern? Than you are going to love what Ms. Wilson did for her next project! Kass said, “A ginko leaf symbolizes longevity and wisdom. Bold colors of tangerine and gray add spice to the traditional Asian style.” And she nailed it with this look! 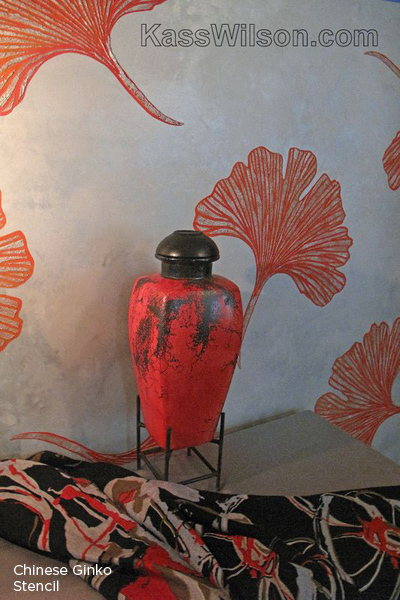 To create this stunning accent wall, she used our Chinese Ginko Stencil. We love it! Don’t you?! And we’re simply in awe of this jaw-dropping gorgeous bedroom. 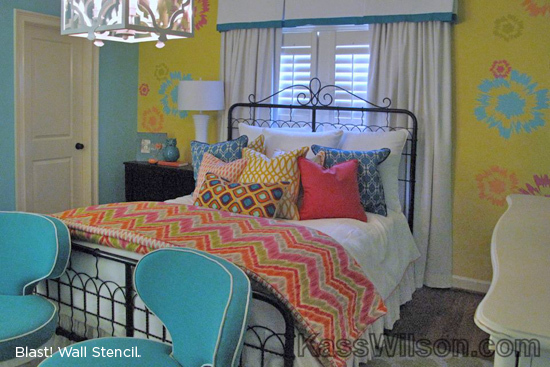 Kass Wilson used our Gabi Brocade Stencil to glamify this space. We love the soft metallic stencil and its unexpected location. 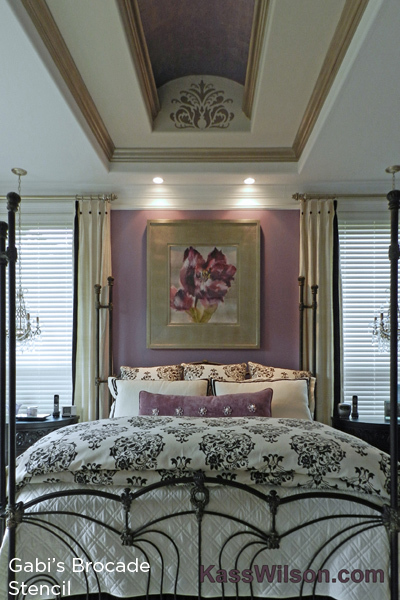 It adds the perfect feminine touch to this lavender bedroom! Here’s a closer look at how lovely it is! 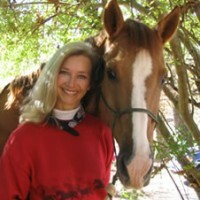 Now don’t let Kass Wilson’s designs fool you! While her spaces are always stunning she can also decorate for fun too. Here’s an awesome space she designed for a teen girl. She wanted the bedroom to have a fun accent wall with big and dramatic SPLASHES of color! Using our Blast! Wall Stencil she created this playful space! And her passion for pattern doesn’t end there! 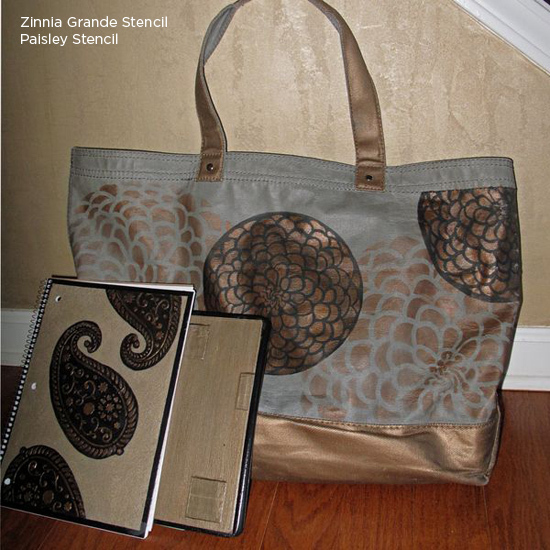 She also brings pattern into her own personal style like with this Zinnia Grande stenciled handbag and this Paisley Stenciled notepad. Do you love it or do you love it? Read these tips and tricks on how to make your own! Which one of these stencil projects is your favorite? We love seeing our fan’s projects so if you’ve completed one, come share it on Facebook! Red, White, & Blue: I Spy A Stenciled Pattern In You! What Stencil Sign Are You? Stencils Make Home Decorating Projects Fun and Easy!